From Bridget Telfer: I am very pleased and excited to announce that our next Collections in Focus talk will be an exclusive talk given by Dr Alex Langlands about the archaeological project he has been working on at Old Sarum. This talk will take place on Wednesday 18 July 2018 at 11am at the museum. Booking is essential – please RSVP to me. Places will be allocated on a first come first served basis. 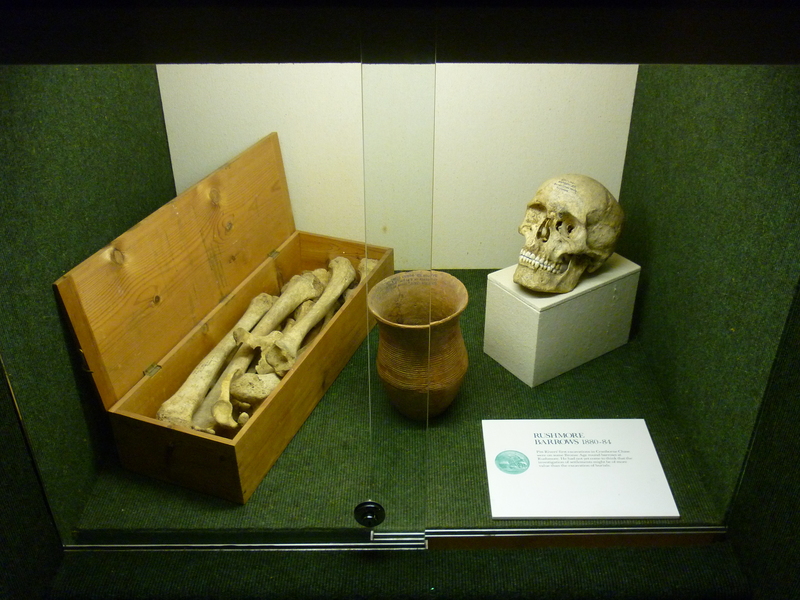 The title of the talk is: ‘Old Sarum, New Perspectives: Excavations in the western suburbs’. In this lecture archaeologist and historian Dr Alex Langlands will review some of the evidence for Old Sarum in the post-Roman and early medieval period. Drawing on old maps, place-names, archaeological excavations, geophysical survey and aerial photographs, a complex picture of urban development can be observed in the area immediately surrounding the hill-fort. Whilst archaeological excavation has been undertaken in the eastern suburbs – given a brief review in this talk – the evidence for occupation on the western side of the will be explored in more depth. King William’s desire to create a centre of Norman power at Old Sarum are clear – with the Oath of Salisbury and the creation of a new diocese at Old Sarum representing a bold attempt to bring church, state and royal power together. But was William choosing Old Sarum as a blank canvas upon which to paint his ambitions or was the hill-fort already a centre of royal power in the late Anglo-Saxon period? 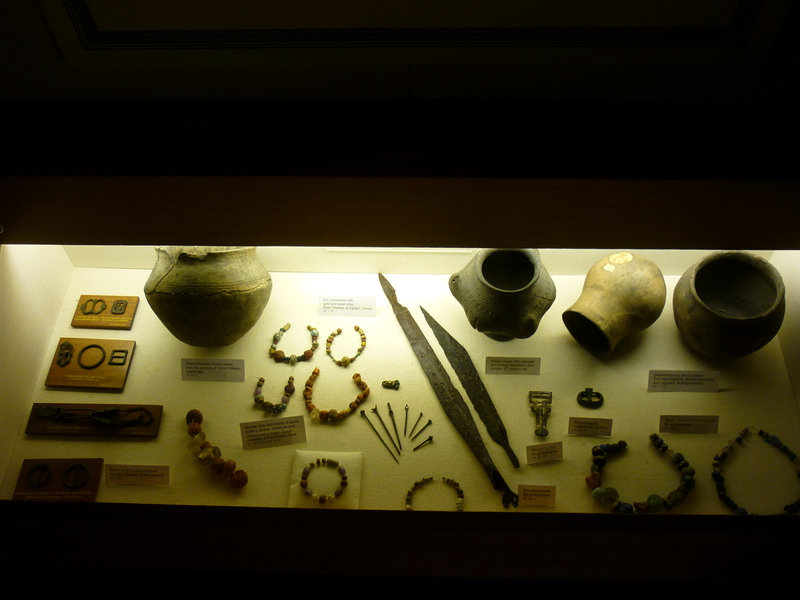 Please see last week’s blog about the tunnel at Old Sarum. Notice the graffiti from decades before. Notice also the dowser or diviner, with his ‘Y’ shaped branch. Diviners have been used to search for water, graves, mines and tunnels over the ages. As recently as the 1960s the US army used them to seek out the enemy underground in Vietnam. Presumably this gentleman was employed to try and follow the line of the Old Sarum tunnel under the walls. If any local readers have any stories about these events, we should love to hear from you. This story has been revived for us by Volunteer Alan Crooks who was, in turn, reminded of it on the recent SALOG visit to Old Sarum. These are notes taken after reading a Salisbury Journal article by Austin Underwood, dated October 13 1988. This blog is written on the 60th anniversary of the rediscovery of the tunnel (November 1957) by Austin Underwood and others. Site of collapse over part of tunnel today. Photo by Alan Crooks. The tunnel was originally discovered in 1795, running from the outer bailey into the countryside on the north side of the site. Severe weather had caused a collapse near the sealed up entrance. Although the local farmer tried to discourage visitors, it became well known for a while and was much visited but was again sealed and largely forgotten until the 1950s when a group of local historians discovered it again. The description in the Salisbury Journal article of that 1957 find is almost as exciting as that of Carter’s breaking through into Tutankhamun’s tomb. The men crawled in to the tiny entrance to the tunnel, despite their wives’ pleas not to, and in a way that health and Safety simply would not allow today. They discovered a tunnel which was 7 feet wide in places. It was full of two hundred year old grafitti – much the same as any you would see today, reports Austin Underwood. After walking in for 57 feet they could go no further. Further exploration or conservation was out of the question as funds are never available. The purpose of the tunnel, and indeed, who built it, is not known. It could have been a sally port (allowing defenders to exit secretly and come up behind the attackers) or simply somewhere from which the castle’s inhabitants could retreat). It might have been built in Roman or Norman times, probably not earlier. Just before the museum closed for the day one evening in mid-October, I was intrigued to see Professor Mike Parker-Pearson of the Stonehenge Riverside Project deep in conversation with somebody in the café. My curiosity was satiated the following day when watching BBC TV ‘South Today’ during which it was reported that he was due to open a new exhibition at the Stonehenge Visitors Centre, ‘Feast! Food at Stonehenge’, which invites visitors to explore the diet and lifestyle of the people that built Stonehenge; and the culture, rituals and identity of food in prehistory (see photos of reconstructed buildings at Stonehenge, below). This was the subject of the second part of a SALOG Volunteers social afternoon on Monday 30th October. On arrival at the Stonehenge Visitors Centre, Volunteers from Salisbury Museum, Wiltshire Museum, English Heritage, the National Trust and Wessex Archaeology were given time to mingle and to enjoy coffee and biscuits before being given a ten minute introduction to the exhibition by the Interpretation Officer, Hannah Brown. 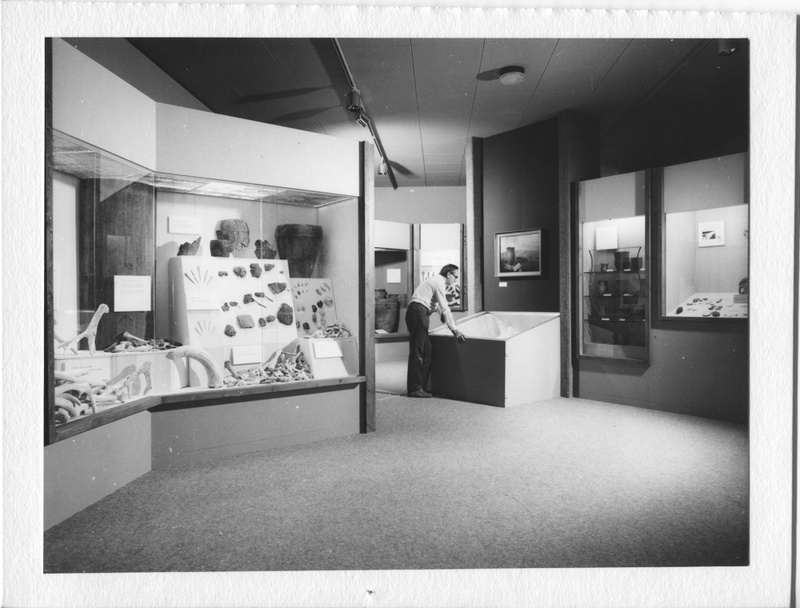 We were then allowed to explore the exhibition at leisure. By way of background, the objective of the Stonehenge Riverside Project was to examine the relationship between the Stonehenge stones and surrounding monuments and features, including the River Avon, Durrington Walls, the Cursus, the Avenue, Woodhenge, and various burial mounds, and nearby standing stones. 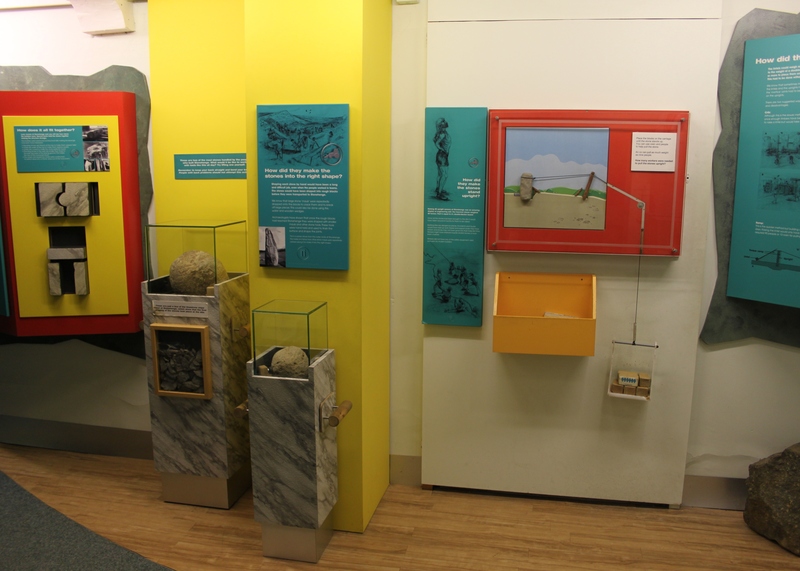 The main aim of the project was to test the hypothesis that Stonehenge was a monument dedicated to the dead, whilst Woodhenge & Durrington Walls, two miles away, were monuments to the living and more recently deceased. It is believed that the builders of Stonehenge settled in nearby Durrington Walls in the 25th century B.C. and excavations of this site have revealed an abundance of food waste, stone tools and pottery, which are thus available for analysis. 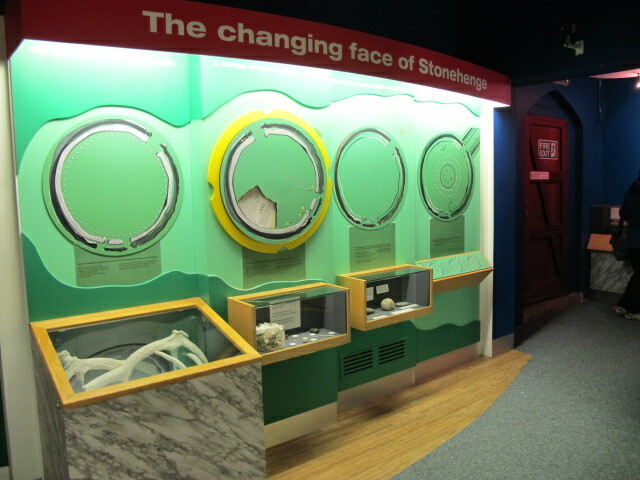 From these artifacts, scientists have been able to show that our ancestors were bringing animals from as far away as Scotland, some 500 miles away, suggesting that Stonehenge was an important site known right across Britain at this time, and that people were travelling these sorts of distances in order to participate both in the building of the monument, which occurred in several phases, and in midwinter feasts. Some discussion ensued as to the logistics of driving animals these distances, and the time it would take. As a chemist, I was particularly interested in the techniques used to establish these facts. For example, animal bones can be identified by inspection and it is clear that our Neolithic ancestors at Stonehenge were deriving meat from a variety of sources: cattle, pigs, sheep and goats. The distances travelled were established by analysing the ratios of strontium isotopes in their teeth by the technique of Liquid Chromatography-Mass Spectroscopy. Strontium compounds, which mimic calcium compounds and therefore enter animals’ teeth, are present in the soil and enter the animals through the food chain. The particular ratios of strontium isotopes identified reflect the underlying geology where the animal once lived. As a chemist and, latterly a chemistry teacher, I was impressed by the clarity of the diagrams used to illustrate these points, and would have been delighted to have had this example and diagram illustrate this analytical technique (Fig 1). This reminded me of a particularly popular experiment I devised for Key Stage 3 Science students, where we used rennet to curdle milk to make junket. We flavoured the product with strawberries and were able to consume it afterwards, having taken appropriate H&S precautions during the preparation. Again, this would have been a useful illustration to have used at the time. Earlier there was a visit to the inner bailey at Old Sarum. Being only a mile from my home I am very familiar with this site. Nevertheless, some new things were brought to my attention, for example a ‘mason’s mark’ on a stone block in the east range of the courtyard house (Fig 3). A question was asked and some discussion ensued about the little-known tunnel which once existed through the northern rampart, the site of which is still visible (Fig 4). The English Heritage ‘Old Sarum’ guidebook tells us that this tunnel was first discovered in 1795. This discovery was recorded in the ‘Gentleman’s Magazine’ of February 2nd, 1795. Following this, the tunnel was much visited by members of the public for several years before being re-sealed in 1822. The tunnel was re-excavated in 1957 by the Ministry of Public Buildings and Works (now Department of the Environment) assisted by members of the archaeology section of the Salisbury and District Field Club, including Davids Algar, Sanders and Truckle, during which, among other things, examples of dated 18th Century obscene Anglo-Saxon graffiti were found. Nobody is quite sure who built this tunnel, or for what reason. Its construction was apparently beyond the skills of Iron Age Man, but various people have speculated that it was built by the Romans or the Normans. One theory, which was also that espoused by our EH Guide during this visit, is that it was a ‘sally-port’ to enable an enemy force to be attacked from the rear or, if the city were besieged, to provide a means of escape from it. A fuller description of this tunnel and the 1957 excavation can be found in The [Salisbury] Journal of 13th October, 1988, ‘’Old Sarum’s Secret Tunnel’ .